Lately at work, I’ve been hanging around a lot of talk about snack foods. Normally I’m not really much of a snacker; I never buy chips or pretzels or anything like that, because I generally don’t crave them. But for the past week, I’ve been taking a lot of notes about people’s snacking habits, and as a result, I found myself really craving salty snack foods. 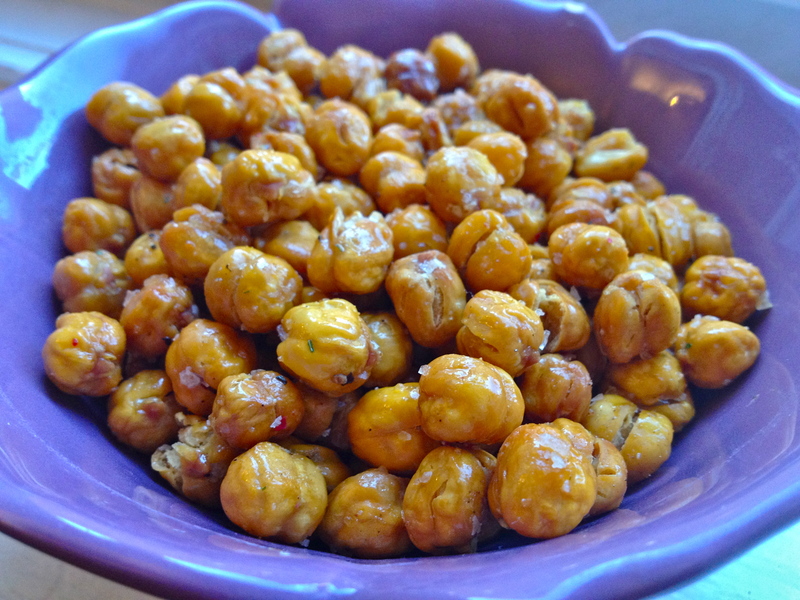 This led me to two thoughts: 1) I have a reaffirmed belief in the power of advertising to get people interested in products they never would have cared about before (i.e., me craving snack foods), and 2) I wanted to give these roasted chickpeas a go, after having seen them on a handful of blogs over the past month or so. 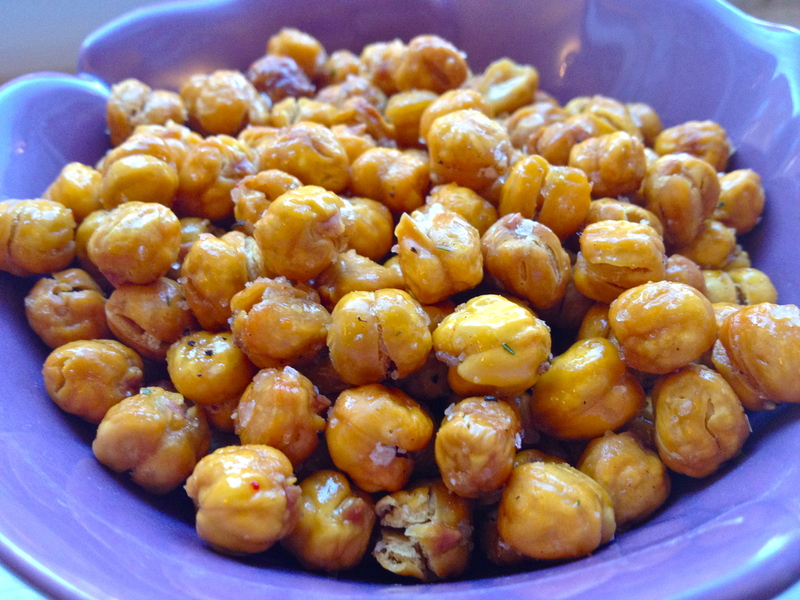 Roasted chickpeas make a fantastic replacement for chips. They’re crunchy, salty, spicy, and come in any flavor you can make. So make some! 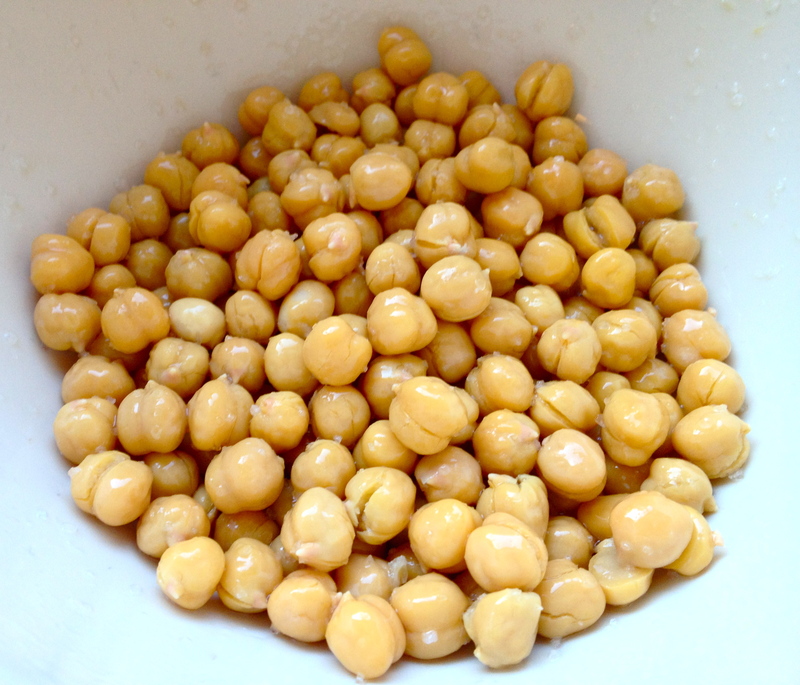 The chickpeas require quite a bit of prep: Drain them. Rinse them off. Remove the skin from each little bean, pretending you’re a rabbi conducting a hundred brises. Lay them out on a towel and gently pat them dry. In a bowl, toss them with a drizzle of olive oil and a good sprinkling of salt. 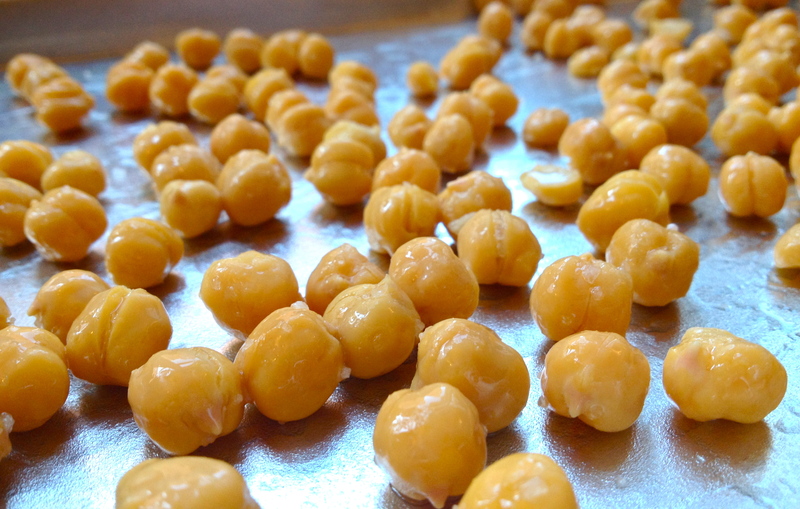 Lay the salted, oiled chickpeas out on a baking sheet. Bake about 50 minutes, until they’re crunchy and browned. Now, the seasoning part. There are so many flavor combos that I want to try! Paprika and cumin, parsley and granulated garlic, honey and cayenne pepper, and good old salt and pepper – all yummy pairings. For this batch, I used one of the Spice House‘s awesome Chicago neighborhoods spice blends – the Ukrainian Village seasoning – which has a great blend of onion and pepper flavors. I topped it off with a little sprinkle of truffle salt, just because I was feelin’ fancy. That’s it! I love these. They’re a great, substantial snack to munch on when you need a crunch but don’t want to go the chips or nuts route. Enjoy! And be sure to let them cool completely before you put them in any kind of container, or else the heat/condensation will make the chickpeas soggy. Previous Spinach and Tomato Tart with Bleu Cheese. Next Bean and Caramelized Onion Quesadillas. The only bummer is how fast they disappear! So good. Yes! 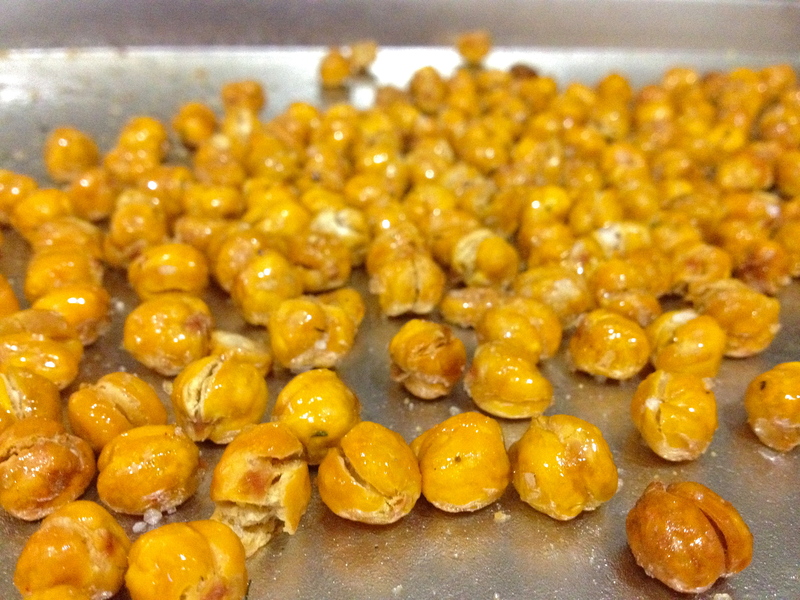 Love roasted chickpeas. Also, “pretend you’re a rabbi conducting a hundred brises.” DYING OF LAUGHTER. hahaha – I really should try to bring more of these elements of the ridiculous into my recipes, it makes them so much more fun to read…. LOL, like you’re a rabbi conducting 100 brisses. hahaha. I wondered if that crossed the line into “not suitable for recipe talk.” thanks for appreciating my goofy inappropriateness!